That is one heck of a milestone isn't it? 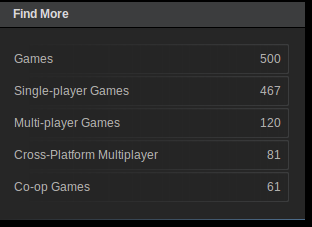 500 Linux compatible games are now on Steam which is a pretty great number to point anyone at. No longer will people keep stating "but Linux has no games", but sadly they will say Linux has very little AAA games which is true, but this will be a gradual build up of course. I keep saying this, but I still never thought we would make it to a day like this. We have XCOM, Civilization and many more still to come with some surprise announcements later this year I've no doubt. Once the Steam Machines/SteamOS are released, and if they are successful we should see the number rise even quicker. So, how long before we hit 1000? End of the year maybe, who knows! I will go get my party hat now...are you celebrating this milestone? 1000 by the end of the year actually seems feasible, seems to be exponential at the moment. But the news that steam machines are delayed may slow things down. That said, releasing before steam machines is probably a good call for developers so they can get bugs ironed out before then. To put the number in perspective, PS4 and xbone have under 200 games each, so that's more than both combined (most of which aren't exclusives so even 300 unique games between the two would be extremely generous). Obviously, there's still the lack of AAA games, but given that most of Linux gaming's future rests on steam machines and that no console in history has had even close to 500 games at launch (will be much more by then too) then the future looks pretty bright. To put things in perspective again, the xbox 360 had 18 games at launch and only a handful of those were half-decent AAA titles, the rest sucked. If I was still a console gamer now, I would buy a steam machine over a console hands down. Its success will just depend on the marketing behind it. That said, releasing before steam machines is probably a good call for developers so they can get bugs ironed out before then. The number crossed 400 less than two months ago. Considering the current pace at which games are greenlit - and the plans to drop the greenlight process altogether - the number is likely to double by next spring, but sadly the quality of releases is another story. Weird, if you do this search it shows 500, but yours shows 495 for me as well.